Baby Annabel New Baby Annabell Vintage Carriage Pram Christmas Gift by Baby Annabel at Baby Bouncers & Swings. Hurry! Limited time offer. Offer valid only while supplies last. 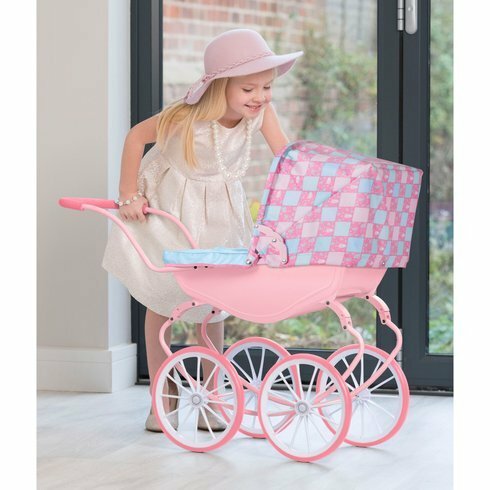 Be the envy of all your friends with the classic vintage style Baby Annabell carriage pram with spring chassis, adjustable hood and removable apron. Be the envy of all your friends with the classic vintage style Baby Annabell carriage pram with spring chassis, adjustable hood and removable apron. Make sure Baby Annabell is comfortable with her pillow and bedding. The Baby Annabell pram has a handle height of 61cm. Perfect fit for your Baby Annabell doll. If you have any questions about this product by Baby Annabel, contact us by completing and submitting the form below. If you are looking for a specif part number, please include it with your message.